A University of Iowa study may have found a way to check the lungs of smokers and determine which are most at risk of developing emphysema. University of Iowa professor Eric Hoffman has been doing imaging of the lungs for about 30 years. 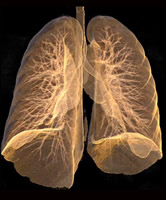 He and his research team used CT scans to measure blood flow in the lungs of smokers and non-smokers. “To establish what’s normal of all the measurements we can make,” Hoffman says. CT scans have traditionally been used to inspect the interior anatomy of the body — the architecture. Hoffman and his team use various techniques to measure the way the body functions, specifically the way blood flows in the lungs. Hoffman’s research team studied 41 people with normal lung function; 17 were non-smokers and 24 were smokers. The CT scans found a dozen of the smokers had “very subtle signs” of emphysema and that group of 12 smokers had “disrupted patterns of blood flow” in their lungs.